E3D V5 cooling tower for the E3D V5 hot end assembly for 3mm filament. This E3D V5 Cooling Tower is built for 3mm filament extruders and Hotend Assemblies, and helps to radiate heat away from the filament to keep it cool before it reaches the heater block. 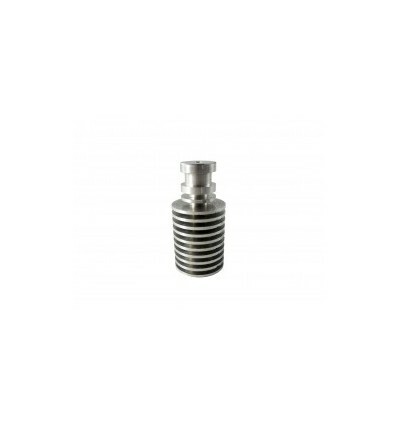 This greatly reduces any chances of jamming, blockages or leaks within the hotend, and ensures that the filament only gets hot once it reaches the heat zone where it’s melted. This radiator has machined thread on the bottom to fit onto a 3mm direct drive hotend while the top fits onto a direct drive extruder, with space in the middle to fit a 30mm Mounted Fan. This results in higher quality prints with less unnecessary problems during the printing process, making it a great investment for anyone using a 3mm direct drive extruder and hotend 3D printer. Bear in mind that this cooling tower is designed for direct drive Extruders only, and does not support Bowden-style extruders. Designed specifically for 3mm direct drive systems, this E3D V5 Cooling Tower is a great investment for improving the overall quality of prints. If you have an older version or need to replace your current cooling tower, you won’t be disappointed when you invest in this quality product. *Note: This is not supplied by E3D, although it is manufactured to the same specs and quality controlled locally to ensure it functions exactly as expected - while saving you money.